We have just implemented this as a new feature allowing the use of Calculations based on specific conditions. To learn more about this, here's my test form https://www.jotform.com/61551439806964. We'll use it as a reference for the steps mentioned below. 1. On Form Builder, go to SETTINGS > CONDITIONS. 2. Then select the UPDATE / CALCULATE FIELD option. 3. First, setup the IF STATEMENT - This is the rule that needs to be met for the conditional logic to trigger its action. Then, setup the DO STATEMENT to CALCULATE A FIELD'S VALUE. 3A. Below is a screenshot to where we can do a calculation using the input from other fields. In my case, I will add the textboxes NUMBER 1 and NUMBER 2 then output it on a textbox named TOTAL. This conditional action will happen only IF textbox NUMBER 1 IS FILLED out. You can see this on my test form. You can add the other form fields by clicking the ADD FIELD button. 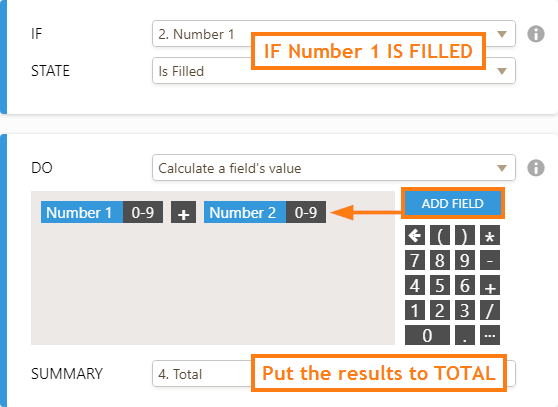 Make sure that the fields are set to 0-9, meaning their value is numeric. You can also insert your own formula here, you can see the number pad at the right side and the math functions there. After clicking the SAVE button, this is how it looks like in my CONDITIONS LIST. 3B. Now how to insert a static text? Simply type the text in the textarea field under the DO STATEMENT. Set the target field where you want to output the text. In my case, this conditional action happens when the specific drop down field in my form is set to YES. Notice that the background color is different from a numeric input. It should have a LIGHTBROWNbackground (for texts)instead of BLACK(for numbers). 4. Congratulations! 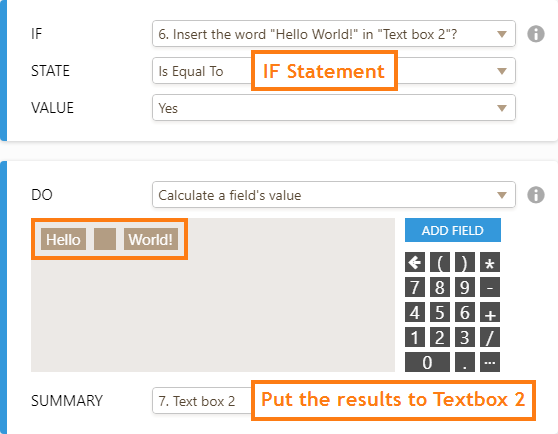 You're now able to insert static text or perform your own calculations using Conditional Logic. Got questions? Please let us know below! how can I add in a static price list by product to calculate depending on the amount put in the table? how to calculate if a date entered on the form is greater than today plus 4 days? how can I make the value of all multiple choice question add up? Good Explanation. I would like to know how to the same operation but the output field should result in an empty value. I have two fields with single choice fields and an image. If the user selects "show the image", it triggers to show the image and field 2. If the user then selects "hide the image" (field 2), then the condition should empty field 1, resulting in field 2 and the image be hidden again. 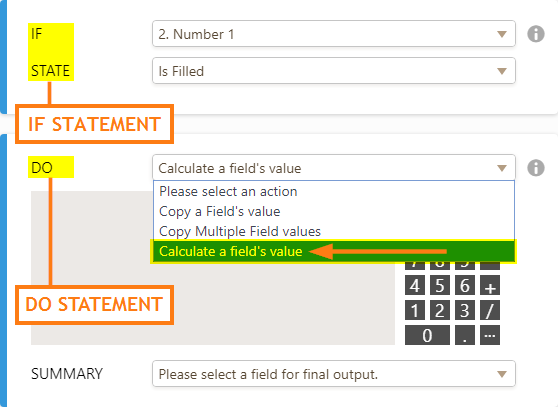 So, if the condition is met, the single choice field (field 1) should be updated/calculated to be empty. Hello, I'm going to apply the compound interest calculation into the form. I'm in need to write this formula: ((a/b)^(1/c))-1 where a, b and c are input fields. I have written the formula as ((field2/field1)exp(1/field3))-1 and it doesn't work. Then I've tried ((field2/field1)pow(1/field3))-1 and it doesn't work too. We use jotform for our special events insurance agency. I'm currently building a form with 2 products and these products have minimum premiums (stated more simply- regardless of the quantity of a product selected the minimum the customer will pay is "x"). Is there a conditional statement I can use to implement a rule like, "The minimum payment is $140 even if the combined value of number of products and price per product x is less than $140"? input with the " Calculation" widget or some alternative. this technique worked but there were various examples within the jotform forum that are similar but not very clear. this is quite big topic and some of the older support entries may need a tidy-up. I can't get the TOTAL RISK SCORE field to accumulate/add these individual risks - it seems that each one over-writes the others. Is there a proper way to do this where the responses to different questions could add to a certain field and that field will display the sum of all numbers added? I need help. I am trying to do a mortgage calculation but I cannot get the answer to display. Can you create a blank text box that the can be filled when a choice in a multiple choice box is checked? I have 3 scenarios from my form: total is less than 50, greater than 49 and less than 100, greater than 99... I have a 3 hidden text boxes that I want to add to a blank text box depending on the result. This will be included in my email to the people who fill out my form. Can't seem to get it to work correctly. Thanks for any suggestions. Hi, I have a multiple choice field, I would like to put a total depending on what they chose. If they chose just one it's $125, if they choose 2 it's 10% off, 3 15% off, 4 20% off. I'm not sure what the conditional logic would be? Or do I have to have each of these in their separate field? Any help appreciated, formulas aren't my best thing. This is not working for me on my UnGala form - I am trying to have the values linked to the cost of each activity in question 1 automatically populate the Donation Amount field. No matter how I set up the conditional logic it won't work. I suspect this is because Authorize.net's payment widget includes the donation amount, cc info, and billing address. Please advise! I need to find a workaround. I have a form that, when the user enters a number into one field, multiple conditions exit to *SHOW* a series of three corresponding fields depending upon the quantity typed into the first field, up to a maximum of four. For example, the main, first field requests a number from zero through four... If a user enters "2", then six fields will unhide. Additional conditional logic declares that if the subsequent series of three fields show, that the second field of each unhid series is then *REQUIRED*. Furthermore, if the second field (single choice radio buttons) in the series is selected as "yes", then the third field (text box limited to 12 alphanumeric characters) is also *REQUIRED*. How can I reset the choice to 'none chosen' in the series field #2, AND reset the series field #3 to have no entry??? Can I have the results display 3 different types of pricing depending on the user's selection? For example, if a user says they are 1. A certain age (say 30 years old), and 2. Are single, and 3. Are male, can we have 3 different price points display depending on the selections? Our teachers need to enter 1 or more form fields with a list of text items. The sub menu reminds them to enter a comma after each item, followed by 1 space. Is there a way that a condition can be set up so that if a teacher forgets to enter the commas/spaces, that their entry will be rejected until they do? I have a 10 question quiz with mainly yes or no values being either 1 or 2. I would like the quiz to auto score at the end and take them to a page where they enter their email address and name to be added to my email list. How can I assign numerical values to text in my form and have those values calculate at the end of the form? This tutorial does not help with that. How would I calculate the cost ($35/night) based on total number of nights, which is fixed until the 7th night, and then there's a discount. There is an additional $10 discount after every 7 nights... so for example, 3 nights would be $105, 9 nights would be $305, and 15 nights would be $505. I would also like to add in other fields to this number, but not sure how to do it from a drop down menu with many different choices. if i want a name to have a maximum of 22 characters (letters) not including spaces in between and not counting the comma and period how do I encode in it the condition box? Wondering how I would show the total number of nights from the Check in and Check out fields. Kind of like hotels do. How do you use this update/calculate a field within the Matrix Dynamique widget? How insert 14/04/2016 in date field, when another field is equal to "yes" ? Hi, I've added some update form values - depending on answer different text - and I want this "calculation" to show up in the autoresponder results. Although I've added the field the output doesn't show up. What have I missed? For example if bullet point 2 is selected, the text says bullet point 2 answer - that's what I want to show up in the email. Is that possible and if so how? I want to use conditional statement auto counter. when auto counter hits limit set it should throw exception to the user not to submit form. if you can help out with the formula? I was trying to get this feature to work with text. If I have a field "NAME" and a field "CITY" can it concatenate the two fields? For example, if the NAME field contains "Joe" and the CITY field contains "London" I'd like a 3rd field to automatically contain "Joe London"
I have three spinners in my questionnaire. I was hoping to use the choice of the first to automatically set the default minimum of the second and third but can see no way to do that. Your example is not working. Besides, I cannot set different values for different choices. It is not working. It shows empty textbox for choices other than first one. Can I use conditional logic in the Autoresponder email? Is there a way to use condition within the subject line or body of the autoresponder email?